There are few textbooks of mathematics as well-known as Hardy's Pure Mathematics. Since its publication in 1908, this classic book has inspired successive generations of budding mathematicians at the beginning of their undergraduate courses. In its pages, Hardy combines the enthusiasm of the missionary with the rigour of the purist in his exposition of the fundamental ideas of the differential and integral calculus, of the properties of infinite series and of other topics involving the notion of limit. Celebrating 100 years in print with Cambridge, this edition includes a Foreword by T. W. Koerner, describing the huge influence the book has had on the teaching and development of mathematics worldwide. Hardy's presentation of mathematical analysis is as valid today as when first written: students will find that his economical and energetic style of presentation is one that modern authors rarely come close to. Foreword T. W. Koerner; 1. Real variables; 2. Functions of real variables; 3. Complex numbers; 4. Limits of functions of a positive integral variable; 5. Limits of functions of a continuous variable: continuous and discontinuous functions; 6. Derivatives and integrals; 7. Additional theorems in the differential and integral calculus; 8. The convergence of infinite series and infinite integrals; 9. The logarithmic, exponential, and circular functions; 10. The general theory of the logarithmic, exponential, and circular functions; Appendices; Index. 'Hardy ... writes in a vigorous and enthusiastic and yet still precise style, with a lot of comments on how the stuff, brand new at the time, should be viewed by the reader. ... The reader feels safe and well-led. ... in a hundred years, the book has lost none of its power. It is still a great reading and a unique inspiration. May the generations of young mathematicians for which Hardy's book will be the gate to analysis continue forever.' EMS Newsletter "First published in 1908, this classic still gives undergraduate students their first dose of the differential and integral calculus, the properties of infinite series and other notions involving limit. Hardy's nineteenth-century sensibilities and approach based on the "Cambridge way" (which produced such fine mathematicians as Maxwell, Kelvin, Rayleigh and Stokes) may have been eroding as the result of new work on the Continent at the time." Books News "Although the sequence of the presentation of the fundamentals of mathematics has changed over the last century, the substance has not. There is no greater evidence of this fact than this classic work by Hardy, which could be used without alteration or additional explanation as a text in modern college mathematics courses... 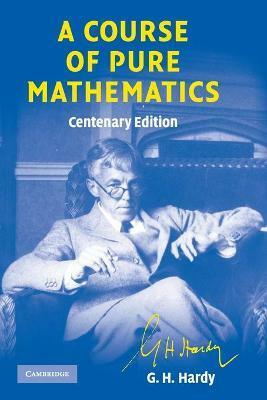 The mathematical influence of G. H. Hardy over mathematical education was and remains strong, as can be seen by reading this masterpiece."